In general, I am against gun control laws. On most days, this is an easy position to take. When I’m not confronted with the threat of a gun, it’s easy to side with more liberty as opposed to less. I’m not a gun person—I’ve never fired or even held a gun—and I don’t think most people should own them, but I don’t want the government taking away a person’s ability to defend himself if he feels it’s necessary. 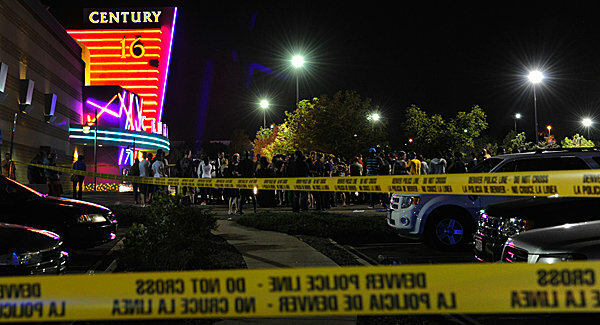 Friday’s tragedy in Aurora, CO has the town and the rest of the country mourning. One of the victims narrowly avoided a similar tragedy just over a month ago. The shooting has also reawakened the debate on gun control. As NYC Mayor Bloomberg said: “Expressing sympathy is nice…but somebody has to do something about this.” James Fallows says that more shootings are a certainty–Will Wilkinson even wonders why we don’t see more of them. Of course, the odds of anything really changing are small. Antonin Scalia and his working relationship with Bryan Garner, the subject of David Foster Wallace’s famous essay on English usage. Speaking of Justices, some interesting memoranda from Chief Justice Roberts’s days in the Reagan administration (more than one involve Michael Jackson). Quite the interactive graphic detailing the use of stop-and-frisks in NYC. BuzzFeed offers the best response to a McSweeney’s parody ever. The weird relationship between Chris Christie and Bruce Springsteen. How much money is actually kept in offshore bank accounts? The use of drones… in North Dakota. On the implications of the A/B test.